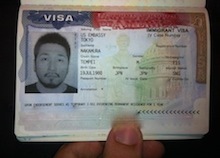 I have a piece of news… Finally I could get the American Green Card! Since it is now the temporary one, in half a year I have to enter the US, undergo an interview and after that I will get the real Green Card!! When I started my European tour in 2010, I had kind of lost interest in America…But then, recently, I understood once more the importance of NYC in advancing in the world for a musician. And, right now, I could finally get the Green Card. I feel it’s destiny…. (for security reasons I shaded off the photo) Thanks to everyone who helped me, from the bottom of my heart. Friends in NYC, I’m looking forward to meeting you again!! !